The Resort 2014 collections have been underway since early May, however for some odd reason they haven’t generated the same amount of traction as the Spring/Summer and Fall collections usually do, perhaps because they are considered extraneous. This is unfortunate because the shows that don’t necessarily follow any particular season, display some profoundly stimulating designs that fall in the perfect space between couture and RTW. Here’s a quick wrap up of the labels that wowed us especially from the lot. Oscar de la Renta (ODLR) characteristically showed off his finesse with lace and bead detailing but he put a spin on his usual delicate style with colorful florals imposed onto grey tartan pantsuits and peplum waists. The result was brilliantly becoming, specifically the marriage between office grey and blood red. The doily lace skirt suits with flared out tops and bubble dresses all denoted a positive vibe and the matching printed shoes were a tempting trend albeit hard to implement. Dior ran with the simple concept of neon electric solids starkly contrasted with airy pastels and sheers and turned it into a work of art. There was something so distinctively pleasing to the eye about the ‘opposites attract’ version of colors playing into the separates, it proved that the best ideas are really under your nose the whole time. Rather than harmony this was more of a chaotic effect as feminine lace was fought by sporty, loud, and rigid streaks that had pushed their way in but the finished product worked seamlessly. Donna Karan’s pieces flowed like poetry in motion and the common feature was a downward pointed, but soft natural silhouette that seemed to find its own path. A few of the pieces resembled the sari drape while the round gold sequins in the others gave the form a beautiful ethnic feel that floored us instantly. The basic polka and striped sarong skirt was another feature we loved and it reminded us of the ‘Lacha’ traditional Punjabi silhouette used by Sania Maskatiya in her Ahghaaz Collection showcase at PSFW’13. From that Donna Karan switched to an angular monochrome striped dress with net inserts that was cut like a dream. Burberry continued to draw on lace but rather than using sheathe dresses and trench coats shown at their RTW 2013 collection, the label tried to infuse a sporty element to the fabric by adding a stretch texture and pairing them as pencil skirts with a casual knit top and peep-toe booties. The designs in the spandex lace were an intricate feature and the statement bow tie backs of the dresses and tops a cute touch. Gucci turned to disco glam taking metallic shiny colored fabrics to create baggy jumpsuits that was a also a common thread between other collections showcased for Resort Wear. The focus has shifted to a somewhat sports luxe feel to the clothes. Everything was baggy including the print on print extreme high-waisted trousers. A sheer chiffon printed jumpsuit with a knotted tie in the front looked like it used to be a dress but had recently been given legs. It was a bit of quirky fun to break free of limitations. Apart from ODLR, floral fury was epically romanticized by BCBG and Tory Burch. BCBG’s take involved pristine white silhouettes laced with composed flower prints. The biker jacket with the studded collar was ingeniously softened with the floral pattern sleeves to displace the harshness with more feminine day time elements. Tory Burch went a little bit brighter and more in tune with the Boho feel that can be traced to her aesthetic. We especially love the chinoiserie feel to the cropped trousers once again displaying print on print. Michael Kors made a comeback to bold and logical color blocking with basic black and earth tones. The blocks were severe and restricted to neutrals. We are fond of the striking nature of his design philosophy and the juxtaposition of solids that followed print in the same color palette was an interesting feature of the theme based collection. Karl Lagerfeld opted for a mash-up of concepts for Chanel Resort wear fitting punk hair and makeup with generous ladylike pearls instead of metal, and to top it off cricket sweater vests. Heavy thick eye liner and spiked hair met 50’s wide legged trousers and pencil skirts. It was a fun and liberating collective touching on a bit of everything as a woman on vacation would, and putting an interesting spin on it. 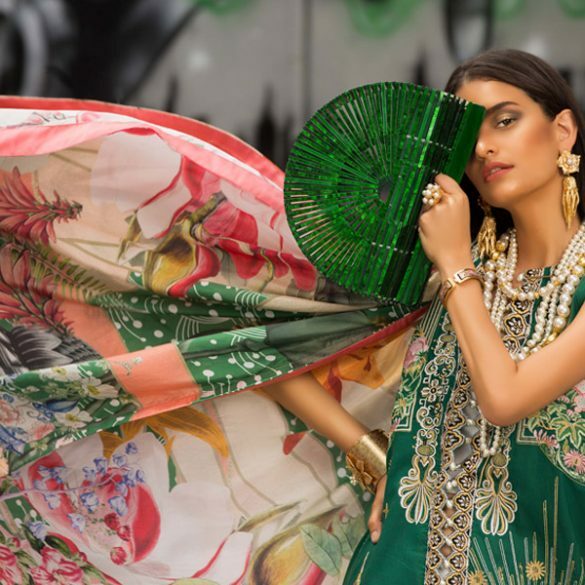 Do you think Pakistan is ready to add Resort Wear to our list of fashion weeks yet? Maybe not, but presenting to a select group of critics and buyers on a small scale the way these Resort Collections were shown might be an interesting idea to point the industry in the right direction. Trend Alert: Top Trends Of The Season We Cannot Wait To Try ! Trend Alert: Tiny 90’s Sunglasses Have Officially Made a Come Back! Trend Alert: Basic Summer Kurta’s Are Back With A Bang! Trend Alert: Top Trends We Spotted At Hum Showcase 2018! Trend Alert: Winter Trends We’re Not Ready To Say Goodbye To Just Yet! What’s in Store: Everything you want to know about Sapphire Lawn Vol 2 !